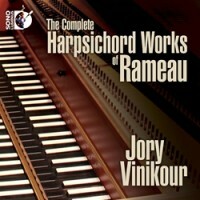 “The Complete Harpsichord Works of Rameau.” Jean-Philippe RAMEAU: Pièces de Clavecin (1706, 1724, 1728); Menuet (1724); La Dauphine (1747); Les Petits Marteaux (attrib. ); transcriptions from Pièces de Clavecin en Concert (1741); Ouverture to Pygmalion (arr. Claude BALBASTRE). Jory Vinikour (hpsi). Sono Luminus DSL-92154 (2 CDs) (http://www.sonoluminus.com/). 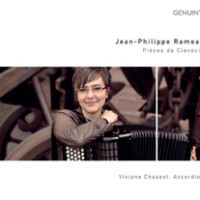 Jean-Philippe RAMEAU: Selections from Pièces de Clavecin (1724, 1728). Viviane Chassot (accordion). Genuin GEN 11216 (1 CD) (http://www.genuin.de/). Jean-Philippe RAMEAU: Pièces de Clavecin en Concert (1741). Noëlle Spieth (hpsi). Eloquentia EL0920 (1 CD) (http://www.eloquentia.fr/). Vinikour tours Rameau’s entire keyboard oeuvre with transcriptions and spurious items thrown in for good measure. It’s a significant endeavor (78:19 + 78:25) for which Vinikour received a Grammy nomination. History informs us that Rameau could be severe and withdrawn, and so perhaps Vinikour’s buttoned-up approach is fitting. However, as Rameau’s maturation took him away from staid dances towards eloquent character studies, we should expect more personality. More attention is paid to longer and later works, i.e., the Pièces de Clavecin en Concerts’ solo transcriptions. The shortest pieces in the 1724 Suite in D (La Joyeuse, La Follette and La Boiteuse) pass without presence compared to the more involved Les Niais de Sologne and its Doubles in which Vinikour permits a welcome rubato. I prefer more fire in Les Cyclopes and expect to be fooled when the third hand appears in Les Trois Mains. Well-known dance movements, such as the E-minor Tambourins or Les Sauvages do not rise above the familiar. Vinikour attempts the Pygmalion Ouverture transcription as if the orchestral version never existed. Of course a harpsichord can’t recreate bassoons playing in their high register or that particular tapered string attack. Perhaps Balbastre could be faulted, but I craved nuance and theatrical flair by the program’s close. The instrument is a 2005 Thomas and Barbara Wolf after a 1707 Dumont which Vinikour does not ride terribly hard. Perhaps the machine is holding him back. Chassot opens with Les Cyclopes, as a signal: We are meant to enjoy her skills as well as Rameau’s caricatures. Chassot shames strict Vinikour. A superior orchestrator, Rameau might have employed an accordion if presented the chance. (Did he use hurdy-gurdies for effect?) Chassot bends tempos, adjusts ornamentation and emphasizes the anthropomorphic and non-musical suggestions. Les Trois Mains flirts (here are the winks I expected from Vinikour), Les Sauvages sounds like a coarse sea shanty, and the Gavotte with six Doubles builds excitement. Everything is played expressively. L’Enharmonique contains an intentionally ambiguous passing tone. In the Suite’s prefatory remarks Rameau claims how frequent exposure makes this dissonance more agreeable. The accordion’s timbre combined with Chassot’s delicate handling of the progression makes the music fresh, even after repeated hearings. Admittedly, the accordion’s reedy sound can never approach the harpsichord’s crispness. Chassot closes contemplatively with Les Soupirs. While I try my best not to let Eloquentia’s cover bother me, it does. The Fourth Concert of the Pièces de Clavecin en Concert contains La Pantomime, a particular favorite, but the beckoning clown is a stretch. That Spieth takes the rarer route of playing these pieces alone without the more customary leading violin or flute with a supporting viol or second violin, should be the focus, not a distraction. It’s a proficient reading that makes one soon forget about other instruments. 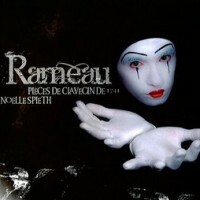 Rameau’s design cleverly alternates foreground and background. In only a few places do we hear accompaniment filigree instead of melody. Rameau addressed this balance with five solo transcriptions (La Livri, L’Agaçante, La Timide’s two Rondeaus and L’Indiscrète). Blind comparisons reveal that Spieth and Vinikour are on par (Vinikour was best in the larger, later works). I still prefer Pièces de Clavecin en Concert played by ensemble. Louis MARCHAND: Pièces de Clavecin (1699, 1702). Jean-Philippe RAMEAU: Pièces de Clavecin (1706). Christophe Rousset (hpsi). Ambronay AMY032 (1 CD) (http://www.ambronay.org/). “Complete Works for One and Two Harpsichords.” Gaspard LE ROUX: Pièces de Clavecin (1705). Naoko Akutagawa, Glen Wilson (hpsi). Naxos 8.557884 (1 CD) (http://www.naxos.com/). Marchand was a virtuoso keyboard player and, reportedly, difficult and abusive. He claimed François Couperin stole Les Bergeries from him (it was also copied into Anna Magdalena Bach’s notebook). If encountered in history books, he’s noted for skipping out of a competition with Bach. Scholars inform us that this is likely untrue since Marchand probably never knew a challenge was in the air. Rousset presents both Livres: The Première (1699) consists of a Suite in D minor, and the Deuxième (1702) is a Suite in G minor. Each Suite contains a Prélude followed with the customary dance movements, thus placing him squarely at the close of Louis XIV’s reign. Since Marchand was apparently ambivalent about publication, perhaps we attribute an older style to what’s extant. They are rather bland pièces. The Sarabande from the Suite in D might be worth getting to know. Three additional pièces (no indication of date or suite) precede Rameau’s Suite in A. Overall, Rousset plays elegantly, yet it’s difficult not to skip over the first 20 tracks to compare this Rameau with his 1989 L’Oiseau-Lyre 425 886-2 recording. Rousset has mellowed. Or perhaps he’s tired. We get superlative refinement with subtle, perhaps insignificant, glimmers of passion. Is Rousset working on other unfamiliar clavenistes to pair with Rameau? Maybe we should enjoy the 1716 Donzelague instrument at leave it at that. Naxos’ Le Roux release is more exciting. 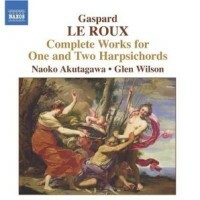 Le Roux’ 1705 publication is played vigorously and insightfully, and while most of the 42 tracks are Akutagawa’s alone, Wilson takes the four unmeasured Préludes and joins his student for a dozen pièces which could be taken on two harpsichords. Why couldn’t Rousset have explored this territory? Here we have two enthusiastic players at music vastly more interesting than Marchand. High points include a formidable Sarabande with a dozen couplets that tower over the other pièces. Le Roux isn’t always this entertaining. London Baroque presents the Suite No. 2 (D major) in a version for two violins, bass viol and harpsichord (BIS CD 1465). It’s a clean, inoffensive release with trio sonatas by Lully, L. Couperin, Clérambault, Marais, Rebel and Geoffroy, with everything blurring together. Akutagawa’s harpsichord rendition is vastly preferable. 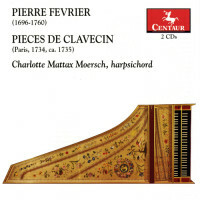 Pierre FÉVRIER: Pièces de Clavecin (1734, 1735). Charlotte Mattax Moersch (hpsi). Centaur CRC 3084/3085 (2 CDs) (http://www.centaurrecords.com/). Jean-Henri D’ANGLEBERT: Pièces de Clavecin (1689). JungHae Kim (hpsi). 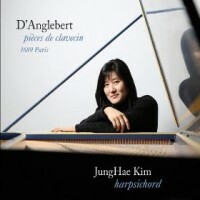 EMJHK1004 (1 CD) (http://www.magnatune.com/ or http://www.junghaekim.com/). Février’s Suites have limited gravity. Moersch does well for the one-and-a-half discs (64:53 + 32:40). Opening with formal movements, these Suites recall prior styles despite their publication dates. Three Suites close with earthy dances, the First Suite’s La Boufonne ou la Paysanne, and Tambourins finish the Fourth Suite in Book I and the First Suite of Book II. There are Fugues too that in no way compare to Bach’s WTC. Février (sometimes spelled Fébrier) is far more entertaining than Marchand, but slightly less engaging than Le Roux. Arriving at Kim’s D’Anglebert selections after Marchand, Le Roux and Février feels like coming home. I have never listened as closely or enjoyed D’Anglebert as much. Kim’s playing is gallant and regal. She shapes passionate melody into D’Anglebert’s meandering, quasi-vocal lines. Perhaps that’s the secret. By comparison, Marchand and Février are hopelessly foursquare, stuck in left-hand, right-hand patterns. Kim selects from D’Anglebert’s 1689 publication to fashion Suites in D minor, G major and D major. The largest offering, Variations (22!) on Les Folies d’Espagne, closes the D-minor Suite. There are a few of D’Anglebert’s arrangements of Lully opera tunes. Kim’s concluding work is the D-major Suite’s Tombeau de Monsieur de Chambonnières. The Chaconne Rondeau two tracks before is a delight. Rousset (L’Oiseau-Lyre 458 588-2) is generally rushed by comparison. Perhaps he felt inclined to fit the entire 1689 publication on two CDs. It is coincidence that both Moersch and Kim play John Phillips’ instruments. Moersch’s is a 2009 after a 1707 Dumont, and Kim’s is a 1996 after the same model. Kim is much more richly recorded and finds a deeper low register without being crackly. “Harpsichord Music for a Thin Place.” Var comps. Var pieces. 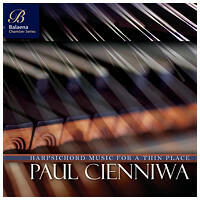 Paul Cienniwa (hpsi). Whaling City Sound WCS 059 (1 CD) (http://www.whalingcitysound.com/). “…pour passer la mélancolie.” Var comps. Var pieces. Andreas Staier (hpsi). Harmonia Mundi HMC 902143 (1 CD) (http://www.harmoniamundi.com/). Presented on a 1966 William Dowd, Cienniwa’s program groups 16 generally slow and meditative pièces, intentionally avoiding minor-mode melancholy. The title’s “thin place” limns a perceived border between the ordinary and spiritual. One pièce is contemporary, Larry Thomas Bell’s Sarabande from Partita No. 1, Op. 97 (2009), and there’s a transcription of the Andante from Bach’s Sonata No. 2 for solo violin. The Couperins take pride of place with four Préludes from L’art du toucher le clavecin and two of Louis’ pièces. La Sylvia and La Du Vaucel represent the Forqueray dynasty. For Rameau we get the Allemande from the 1728 Suite in A, and, like Chassot, Cienniwa closes with an expansive Les Soupirs. From outside France come Sweelinck’s O lux beata trinitas, Byrd’s Ave verum corpus, and a D major Allemande from Froberger. Cienniwa seems more at home in the French works. 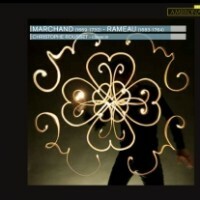 As always, I wish for more Rameau. The BWV 1003 transcription’s rubato feels out of place in passages violinists perform strictly. 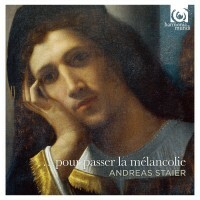 Staier plays an anonymous 17th-century French instrument, restored at this century’s start. Its hazy resonance dulls attacks. Composers include Froberger, D’Anglebert, J.C.F. Fischer, L. Couperin, Clérambault and Georg Muffat. I admit not focusing until Couperin’s F major Suite with the Tombeau de M. de Blancrocher and wandering away again. Kim’s D’Anglebert is more riveting and majestic. As far as collections go, whether moody or otherwise, Cienniwa’s program makes more sense. Staier’s set will sit, forgotten, on a shelf.